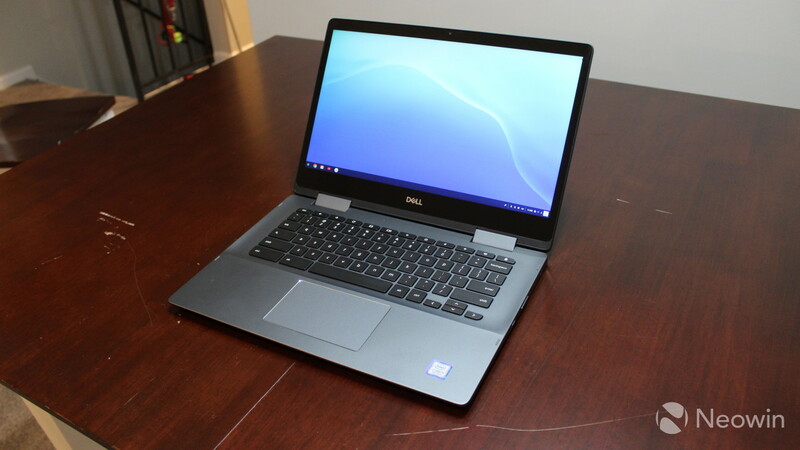 Dell's Inspiron Chromebook 14 2-in-1 is a pretty cool device. 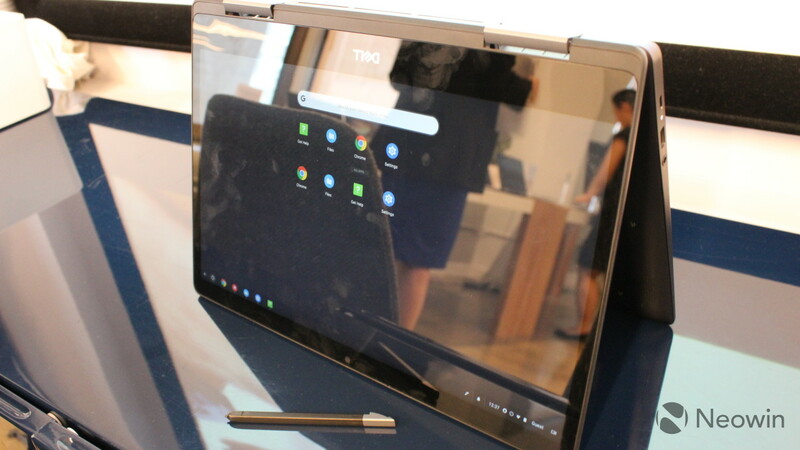 It's a convertible laptop with Android app support, and it has a built-in pen. 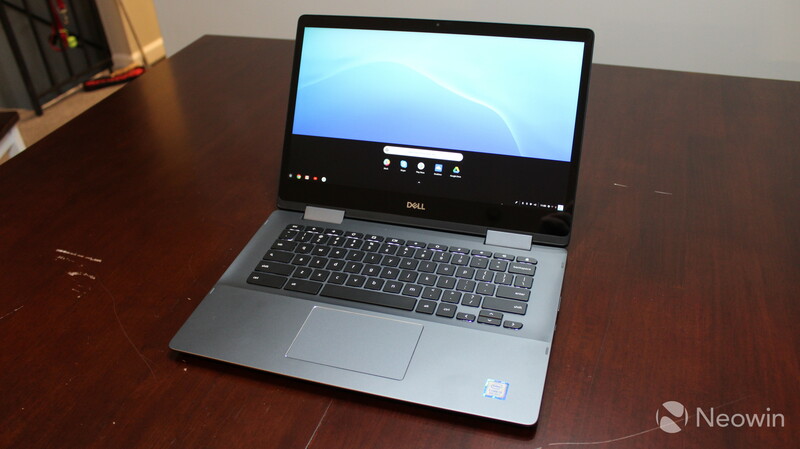 Aside from that, it has pretty solid specs for a Chromebook, with a 14-inch 1080p display, a Core i3 processor, 4GB RAM, and 128GB of onboard storage. In fact, it's pretty much what I've been waiting for. I review a lot of Windows 10 laptops, and while I love convertibles, the Windows 10 tablet experience is awful. 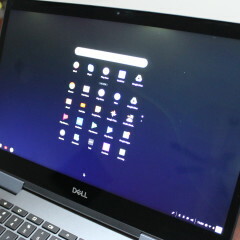 Chrome OS has Android app support though, so what I've always wanted to try out is a Chrome OS convertible - not a tablet with an attachable keyboard - that has decent specs, a high-resolution display, and a large enough display that it can be used as a proper laptop. 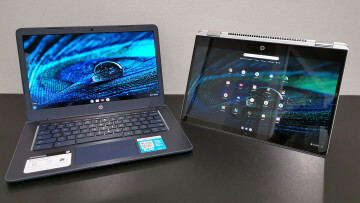 These devices are few and far between on the Chromebook market. Google almost made one, but the PixelBook's 12.3-inch display is too small for me. 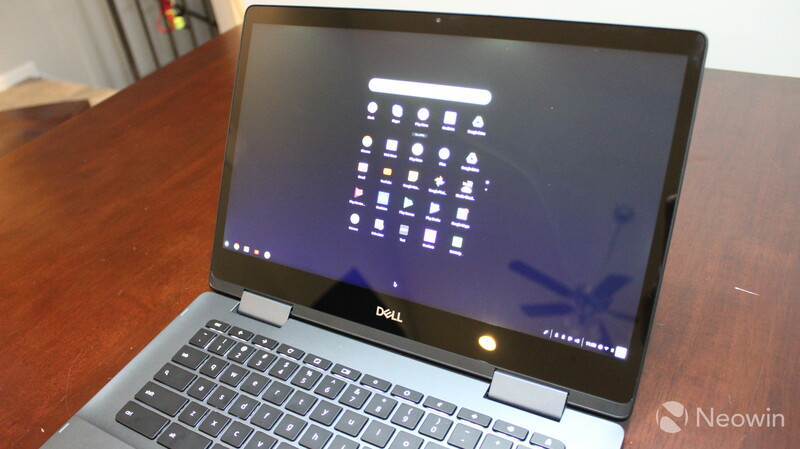 A 14-inch convertible with Chrome OS and Android apps is exactly what I've been looking for. 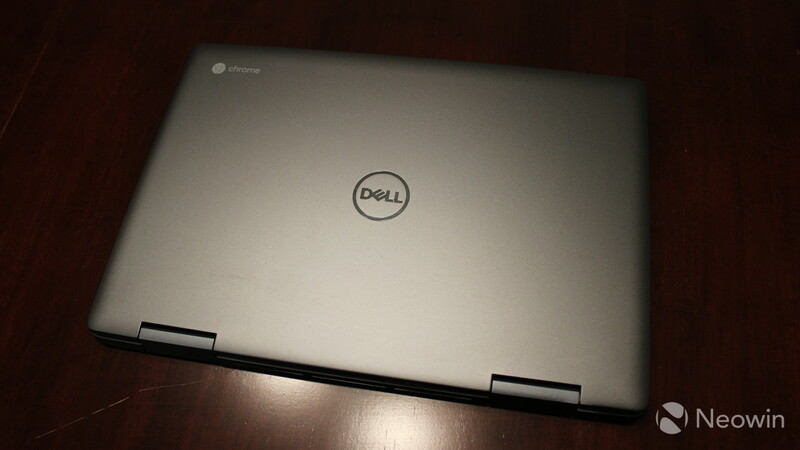 The Dell Inspiron Chromebook 14 2-in-1 comes in an aluminum chassis, which can easily be taken apart with 10 Philips-head screws that keep the bottom panel attached. 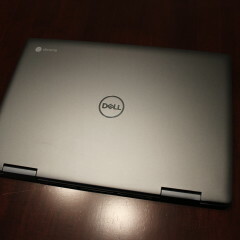 There's not much that's unique about how the PC looks, with its Urban Gray color, Chrome logo on the top-left corner of the lid, and chrome-colored Dell logo right in the center. It's also not particularly thin or light. It weighs in at almost four pounds, so if you put it in your bag, you can feel it there. 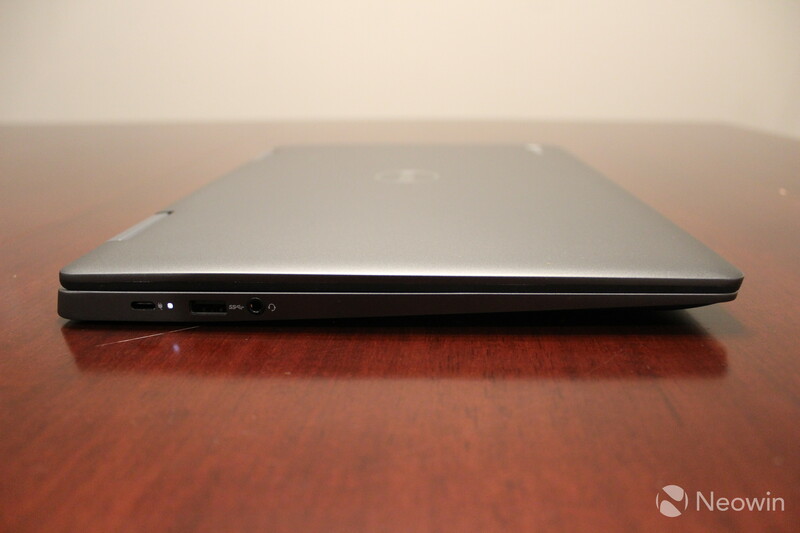 This is also notable for when you're using the Inspiron Chromebook as a tablet, which it is meant to do. It does feel a bit bulky and heavy when doing so, especially since you might be holding it one-handed, with the other hand using the pen. Speaking of the pen, you'll find that in a pen garage right underneath the front-right of the device. I do prefer this method of pen storage, as the magnetic attachments that other companies use tend to not be strong enough. The only downside is that you get a smaller pen when it's built into the PC, but I'm OK with that. If you want a larger pen, you can always use a third-party one. 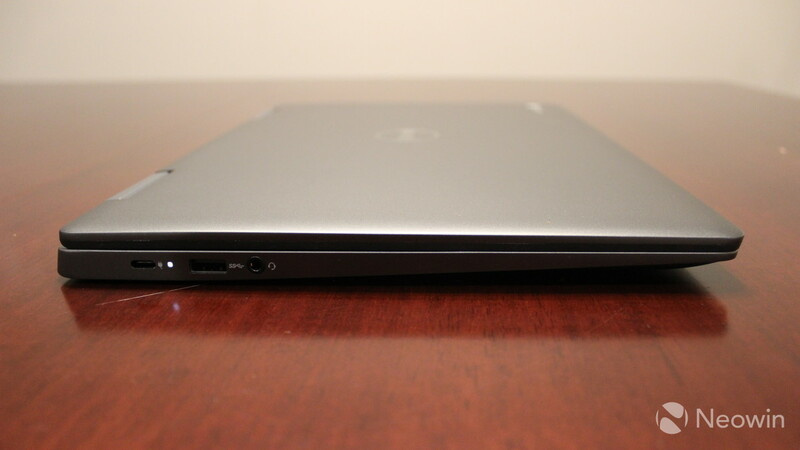 On the left side, you'll find a USB 3.1 Gen 1 Type-C port and a USB 3.1 Gen 1 Type-A port, along with the 3.5mm combo audio jack. 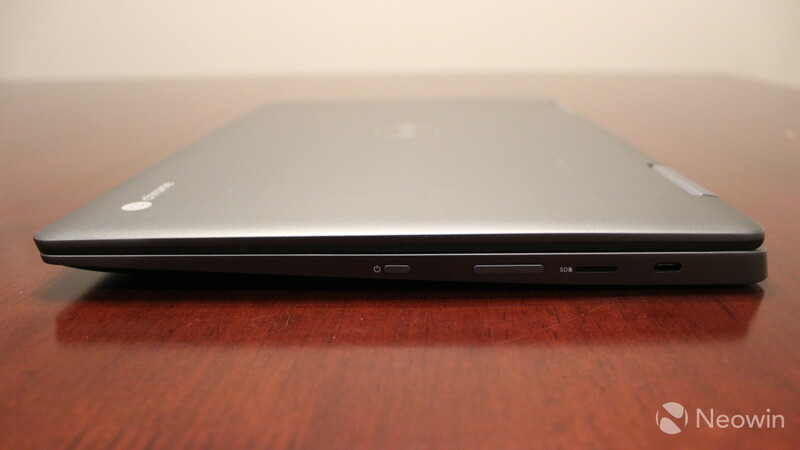 On the right side, there's another USB 3.1 Gen 1 Type-C port, a micro-SD card slot, the power button, and a volume rocker. Both USB Type-C ports can be used for charging. You'll notice that there are no Thunderbolt 3 ports, although that's not really expected on a device at this price point. The good news is that all USB ports are USB 3.1 Gen 1, which support data transfer speeds of up to 5Gbps. I also appreciate a volume rocker on the side, something that makes a ton of sense on a convertible, where you'll be using it as a tablet. 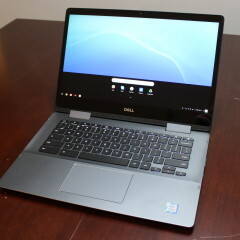 The Inspiron Chromebook 14 2-in-1 has a 14-inch 1080p display, which is quite nice given the price point. Sure, 1440p would be better, as you can see some pixelation, but the color accuracy is on point. 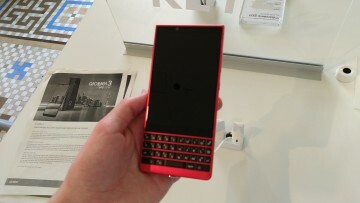 It's a bit glossy though, which can make it troublesome in bright sunlight, so you'll have to crank up the brightness. The bezels around the display are a bit larger than I'd hoped for. It's not a huge deal, as a bit of bezel actually helps when handling a tablet form factor. Bezels do help to prevent accidental touches, despite the current trend of eliminating all bezels. Just as you'd expect from a convertible, the display supports multitouch, with active pen input. I'll talk about this more when we go over Android apps, but it's quite good as a tablet. 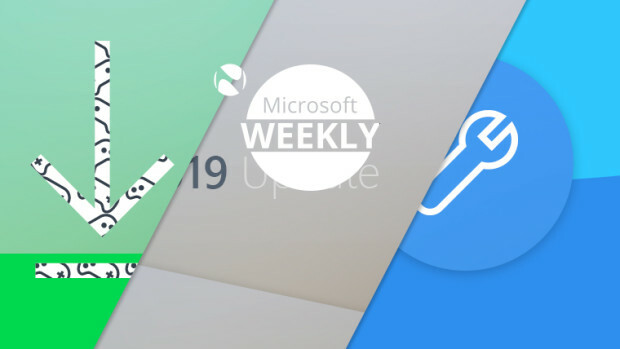 In general, Windows 10 is better for pen support, but when it comes to proper touchscreen support and running proper touchscreen apps, Android apps are certainly the way to go. 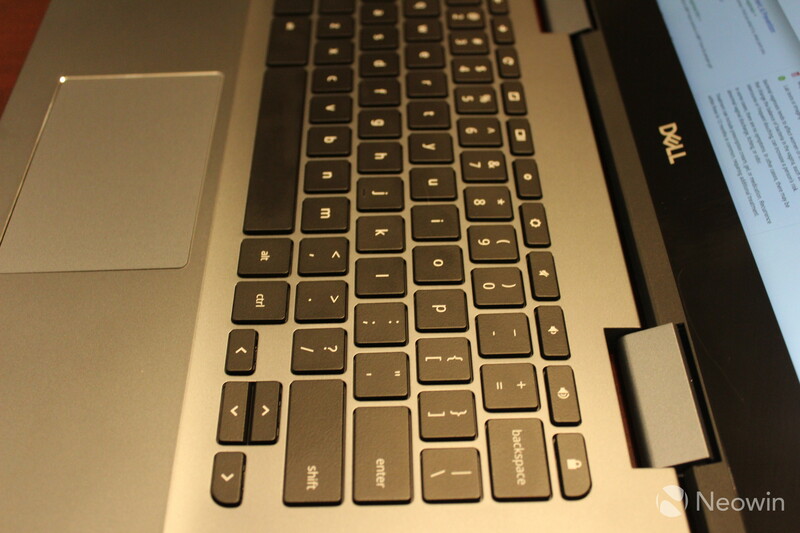 The Dell Inspiron Chromebook 14 2-in-1 has a standard chiclet-style, backlit keyboard. It's fine to type on, which was really the most important thing to me. I do most of my work from Chrome, so the only way a Chromebook will work for me is with a solid keyboard. 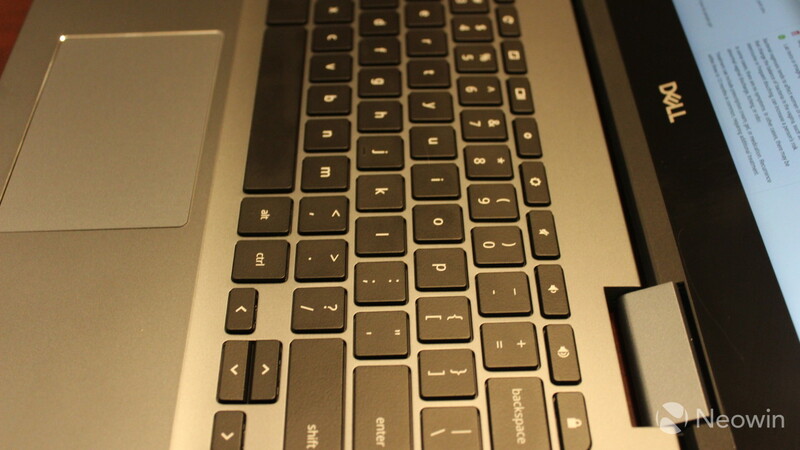 In fact, this is definitely one of the better keyboards you can get on a $599 laptop. It's precise, and not over- or under-sensitive. 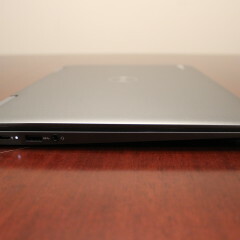 The keyboard is also somewhat sunken into the body of the laptop. This works out pretty well for when it's in tablet mode, or if the keyboard is leaning up against a surface. 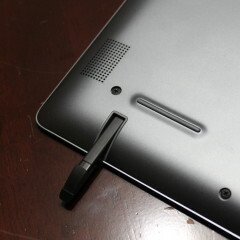 With this design, the keys are flush with the rest of the body, so they don't get in the way as much. 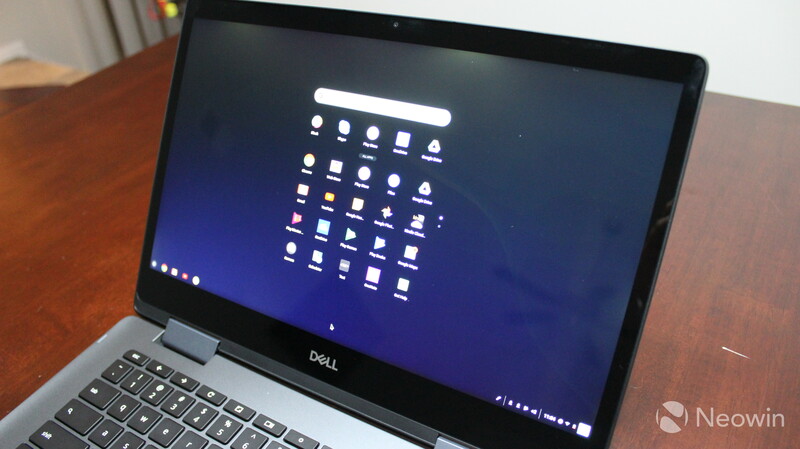 There were a few things to get used to, being that it's a Chromebook and not a Windows 10 laptop. Obviously, there's no Windows key, but there's also a search button where the Caps Lock button would be. To turn on and off Caps Lock, I learned to use Alt + search. Also, there are no function keys. 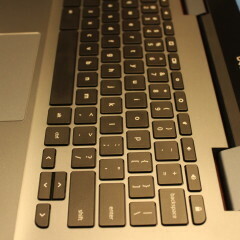 Next to the Esc key are back and forward buttons, refresh, volume and brightness controls, and more. This is really a sign of a more modern OS, as Microsoft combines those types of keys with the F-keys, and you'd have to combine it with the Fn button. 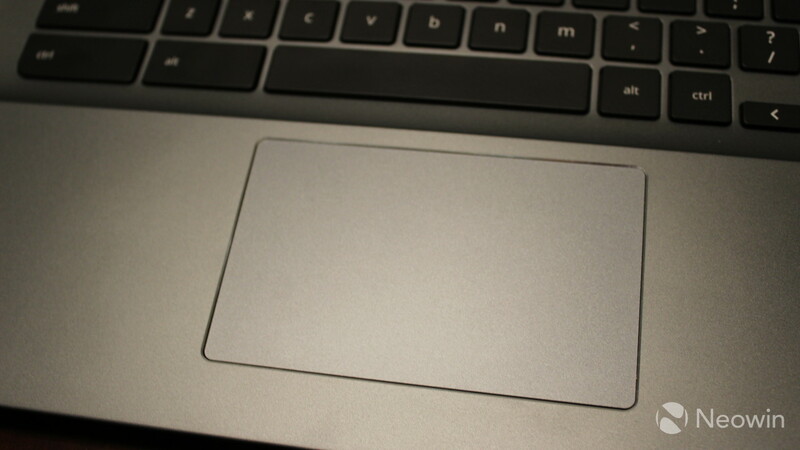 Even Apple is killing the F-keys with its latest MacBooks, replacing them with a Touch Bar that can show them if you need them. One thing that got on my nerves was that the keys are all in lowercase. Yes, I know, it's a trivial complaint. But something about it just feels off when I use it. In fairness, this seems to be the standard for Chrome OS. 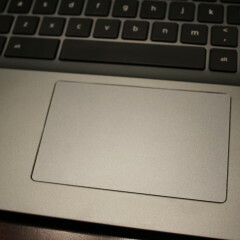 The trackpad is actually lovely. 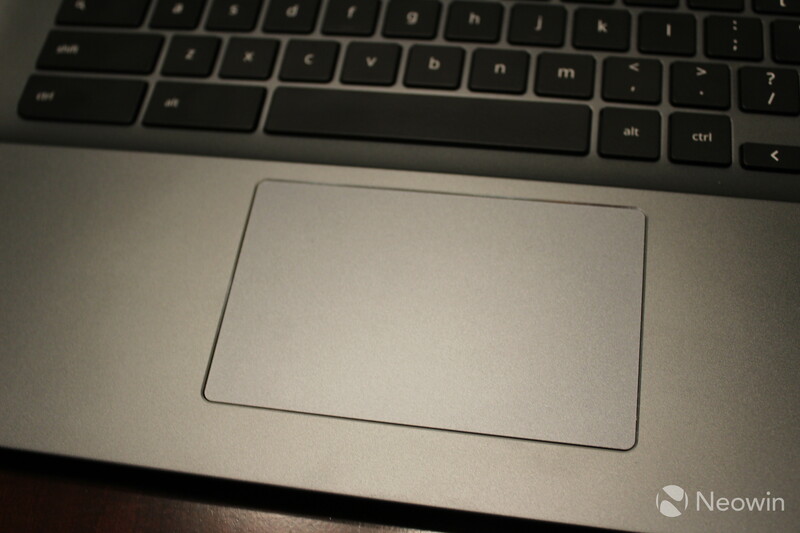 It's a smooth glass trackpad, and for some reason, it's just really comfortable to use. It's not particularly large, and it doesn't support the same array of gestures that Windows does, but it's precise, accurate, and comfortable. 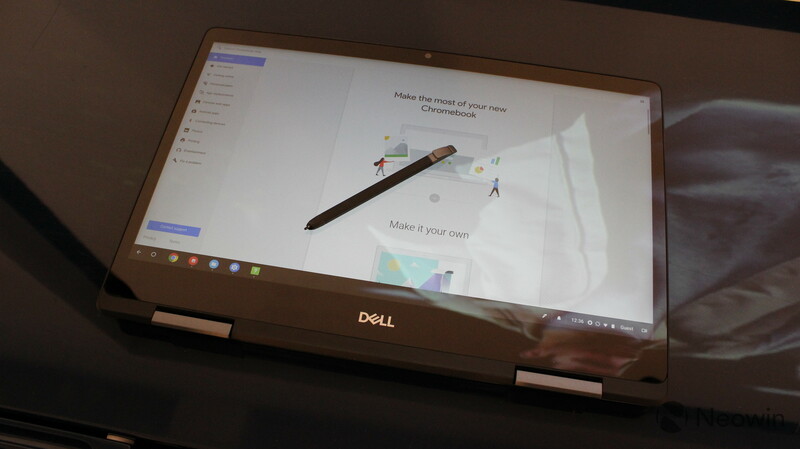 The Inspiron Chromebook 14 2-in-1 has a pen that's stored inside of the device. It's a Wacom pen, so there's no battery in it. 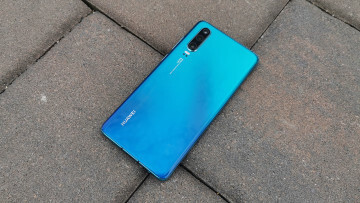 This is unfortunate, because I feel like it would be a better experience with a Bluetooth connection. 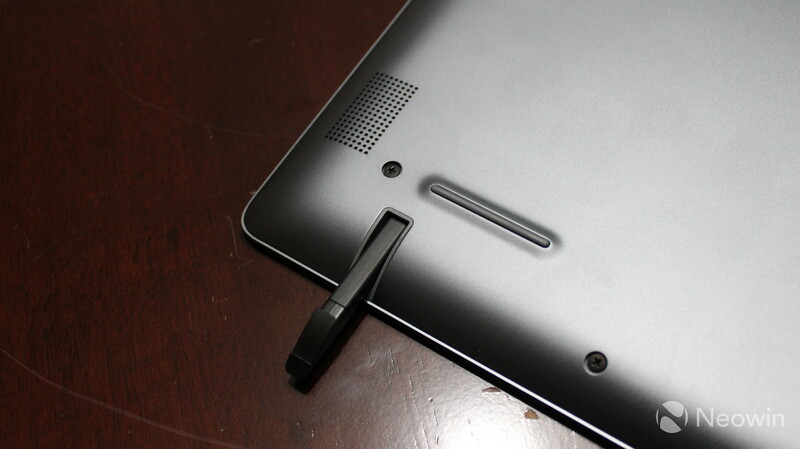 Chrome OS has some built-in features for pens. There's actually a pen icon on the bottom-right corner of the screen, right where the Windows Ink icon would be on a Windows 10 laptop. 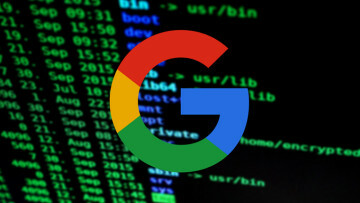 Clicking on it will show a menu that offers options to capture a portion of the screen, capture the whole screen, create a note in Google Keep, or use the pen as a laser pointer. Unfortunately, I wasn't able to change the default note-taking app. There's an option for it, but Google Keep was the only option in the dropdown menu, despite having the OneNote Android app and OneNote Chrome extension installed. Naturally, there's pen support in a lot of Android apps and web apps, although don't count on it. Many Android apps don't really support active pens because the vast majority of Android phones don't have pen support. Still, I always prefer a pen for productivity. I like to take handwritten notes, and just interact with the device in that way. I reviewed the Dell Inspiron Chromebook 14 2-in-1 because I'm looking for the perfect convertible. 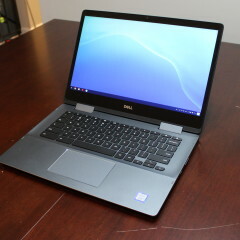 I want a laptop that's great for work, I want to be able to flip the screen and take handwritten notes with a pen, and I want to be able to sit back and play mobile games and stream video on it. The problem with Windows 10 is that it's terrible as a tablet OS. Obviously, it covers all of my needs as a laptop OS, but there really aren't any great tablet apps. Even the Netflix and Hulu apps are lacking when compared to their Android and iOS counterparts. 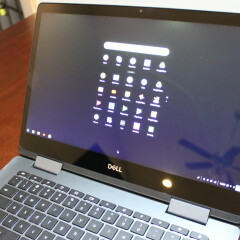 Chrome OS is much better as a tablet operating system due to the Android app support. I think I was hoping for a bit more than they can deliver though. Many apps are just designed for phones, and that's probably not going to change very soon. It's great to have though, and the apps are still better than those that come from the Microsoft Store on Windows. And for productivity, web apps do most of the work. 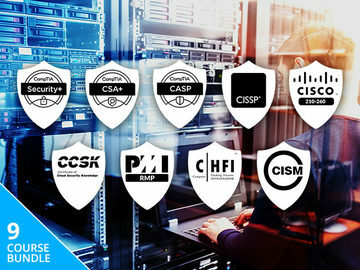 I can still work out of Office Online, Neowin's CMS, and more. 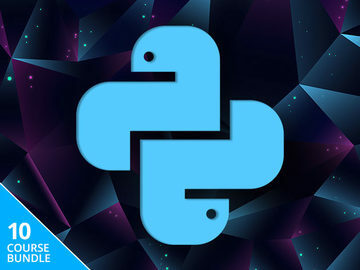 The things that are lacking are the heavier apps I use, like Adobe Creative Cloud. One thing that I didn't like was that cloud storage is pretty much locked down to Google Drive. It's not like Windows or macOS where you can download a sync client. You can get Chrome extensions, which I did look into but decided against due to the reviews. You can also download Android apps for OneDrive, Dropbox, or anything else, but they still won't sync with the file system. One thing I'll say is that the performance is fantastic. Things like boot and wake times are incredibly fast. You just open up the machine and it's ready to go. Instant wake and near-instant boot are unheard of on a Windows machine with an Intel processor. The Core i3-8130U is a 15W chip that has two cores and four threads, and it's built on the Kaby Lake architecture. 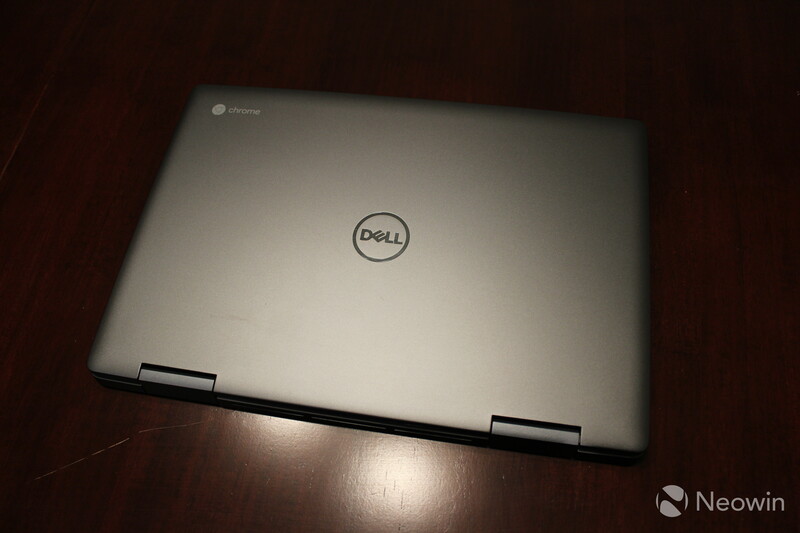 This is an entry-level chip for the Core series, but it flies on Chrome OS with 4GB RAM. Of course, it's not doing much with those resources. It's pretty much running the Chrome browser and Android apps, which were designed for devices that had lesser specs than this. It's fantastic that it has a built-in pen to go with the convertible design. 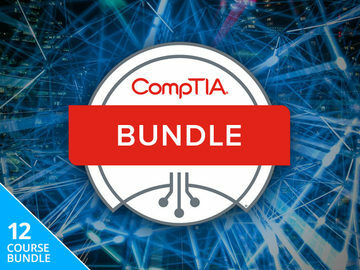 You might not need it all of the time, but it's stored in the device, so it's there when you need it. The PC has a premium keyboard, a solid trackpad, and a satisfactory 1080p display. The real question is if you want a Chromebook over a Windows convertible in the same price range. You definitely get more apps with Windows, including Adobe CC. 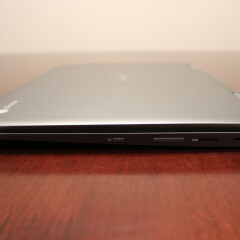 But Chrome OS seriously delivers on performance, and the tablet experience is just so much better. If a Chromebook convertible sounds like it might be up your alley, check out the Inspiron Chromebook 14 2-in-1 for $599.